This past week I did a friend a favor that took me outside my normal routine. In fact, it took me 50 miles north of my home in Seattle, to back roads I hadn't traveled before, on the outskirts of Stanwood, Washington. I enjoy the serendipity that can occur when one is 'out and about in a new neighborhood' like this, so I decided to do a little exploring. Driving north on Cedarhome Road, I found myself at the north edge of Snohomish County, on the border it shares with Skagit County. I had come to the end of the road, and needed to turn right or left. I chose left. Within about 500 feet I saw a sign on the right hand side of the road: Scandinavian Cemetery. I just had to stop and check it out! It wasn't a large cemetery; in fact, it was on the small side. The sign was the only indication that the cemetery even existed. You had to drive on the grass between two farms to get to the entrance about 200 feet back. I stopped the car, and spent about an hour walking around the cemetery, taking pictures and musing about the fact that I had found this simple treasure. When I returned home, I went online and learned more about this 'simple treasure'. 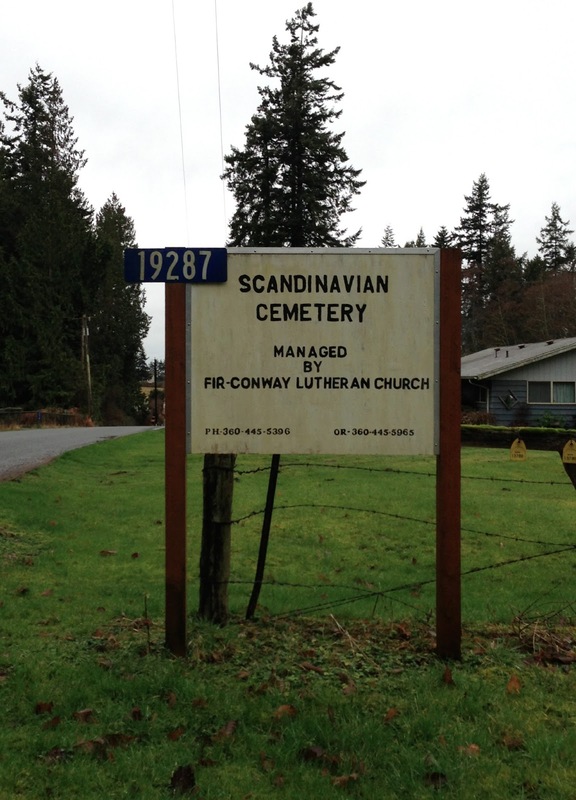 HISTORICAL NOTE: Milltown Lutheran Church was located on the site of the Scandinavian Lutheran Cemetery. The church was torn down many years ago and its congregation split between Fir-Conway, Our Savior's and Freeborn Lutheran Churches. This cemetery is also sometimes referred to as Milltown Lutheran Cemetery. 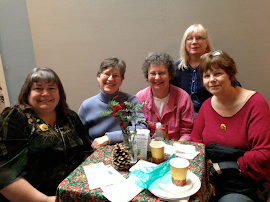 – "Passport to the Past", by Stanwood Area Historical Society and Lincoln Hill High School. DIRECTIONS: From Interstate 5 (north or south), take exit #215. Go west onto 300th St. Turn immediately right onto Old Highway 99. Turn immediately left onto 300th St. Continue on 300th St for 2.4 miles to 4-way-stop. Turn right onto 68th Ave NW (a.k.a. Cedarhome Road). Follow for 2 miles to stop sign. Turn left onto County Line Road and proceed 0.2 miles. Cemetery is on right hand side. The drive into the cemetery goes between two fenced farms, back a short way off the main road. SURNAMES: Barden, Bransmo, Brevik, Bustad, Chappel, Coss, Dahl, Ekrem, Evensen, Falling, Flones, Fluke, Glade, Hanson, Haugen, Haugen-Kvalem, Jemmingsen, Hendershot, Imislund, Kvalem, Larson, Leed, Lund, Melley, Nordahl, Nyquist, Odegard, O’Neal, Paulson, Peep, Petersen, Reines, Robertson, Wobertson-Wimmer, Rued, Sater, Seabury, Slater, Smock, Strom, Vaara, Visten, Walter, and Zoberst. I was randomly clicking on the various 'names of the deceased' on the www.findagrave.com, and clicked on one for THORA ROMOLA BUSTAD SEABURY. She was born in 1923, and passed away in February 2007, almost six years before the date of my visit. 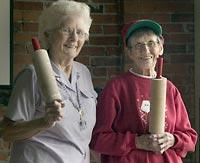 When I got to the page, there she was in a photo with a friend, each of them holding a lefse rolling pin. 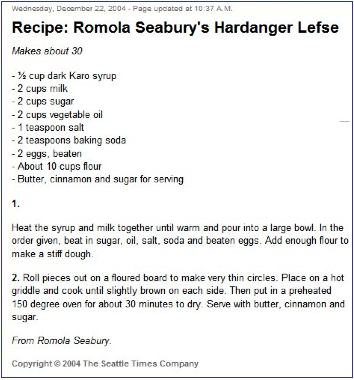 Below this picture was another one, this one of a recipe for Romola Seabury's Hardanger Lefse. What a delightful surprise! As I sought to get a closer look at Romola's photo, I stumbled upon the text of Nancy's Seattle Times newspaper article, which was published on Wednesday, December 22, 2004. The title of the article was Passing Down Tastes of Beloved Norway, and the full article had been uploaded to the find-a-grave website! I did a little more digging, and found the obituary for Romola Seabury that had been published in the Stanwood / Camano News on March 7th, 2007. So I copied it, and posted it to the find-a-grave website as well. I also found that her husband, Harold W. Seabury, had passed away just three months later, on May 12, 2007. I went meandering, and came away with a few good nuggets of discovery. I 'gave back' by taking some photos and posting them on a website. I got a new Hardanger lefse recipe. I got a history lesson. And hopefully, I made someone smile today.